Scotty continues to master the varied parts of his job working with his two supervisors Bonny and Korrine who volunteered to develop tasks and training for Scotty. Under their watchful eye, Scotty has grown into his role, gaining confidence by learning his tasks which had previously been performed by the instructors. 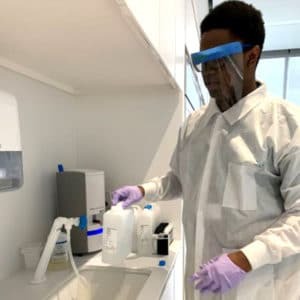 Scott is responsible for rinsing reagent containers for recycling, replacing biohazard bins, stocking lab coats and gloves, unpacking deliveries for the lab and then stocking the products in their correct location and rotating the stock and then recycling the packaging materials. Fridays find Scotty busy setting up classrooms for the following week’s client training sessions. After cleaning all of the tables he sets up workspaces for each student with a pad of paper, pen, highlighter, and post it tabs. He then places name cards, sets out instructor materials, cleans the whiteboards (making good use of his over six-foot tall frame) and makes certain the classroom is well stocked with tissues, hand sanitizer, markers, and classroom signs. This partnership with Roche and Best Buddies has been a home run from day one. The Roche team has embraced Scotty in a way that exemplifies the meaning of inclusive employment. Scotty knows that his work is appreciated and adds value to Roche. His coworkers include him in social situations and actively engage with him on a daily basis. If you would like to learn more about the Jobs program please contact the Best Buddies office at (317) 436-8440. 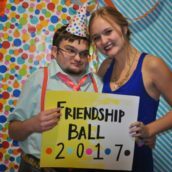 The past two weekends have held lots of excitement for Best Buddies Indiana: the 2017 annual Friendship Ball, and the 2017 Champion of the Year wrap-up, Party with a Purpose. Read on for a recap of each of these exciting events! 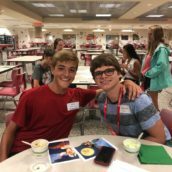 Back to School with Best Buddies! 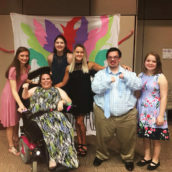 It’s been an exciting first couple months of the school year as chapters have held call-out meetings, match parties, and recruitment events to tell all their friends about how fun it is to be in Best Buddies! We are so excited about everything that our chapters have accomplished and are so excited to see their successes continue over the summer and into the upcoming year!